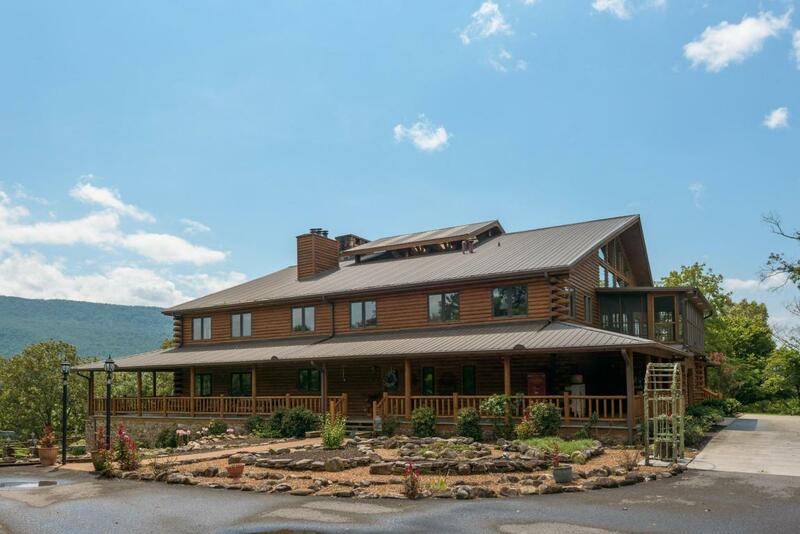 This ONE OF A KIND Lodge-style Home is situated on a choice piece of property with SPECTACULAR MOUNTAIN VIEWS on the Sequatchie River. 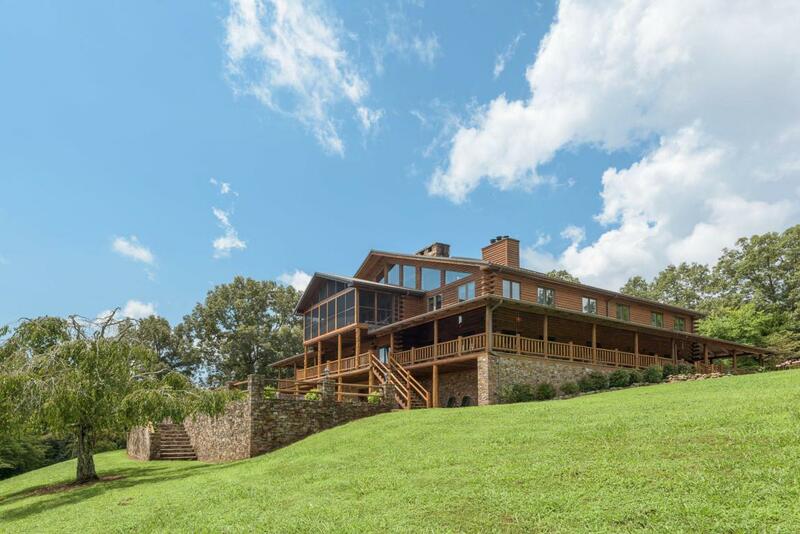 Surrounded by woods and at the end of Lockhart Rd for complete privacy, this home is the perfect retreat from the city. 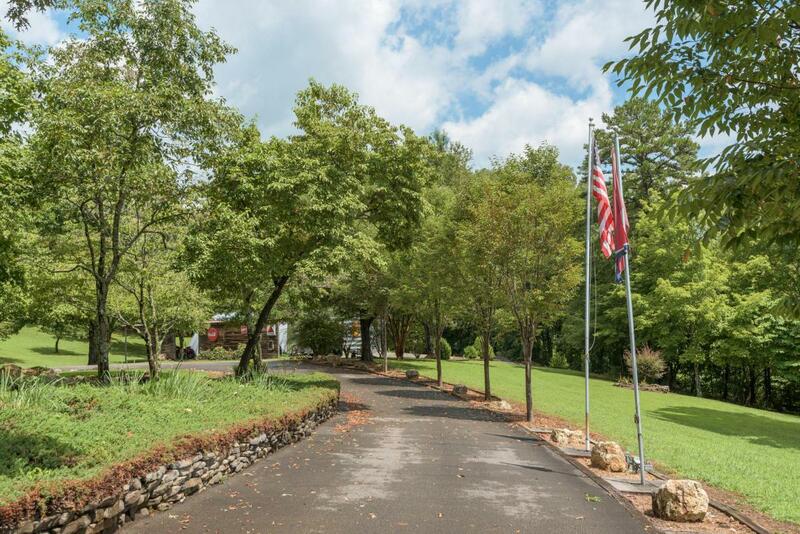 The property begins along the base of the Sequatchie river and several acres have been cleared as wide open space for a variety of uses. Approximately 800 ft fronts the river making for easy use of the water. 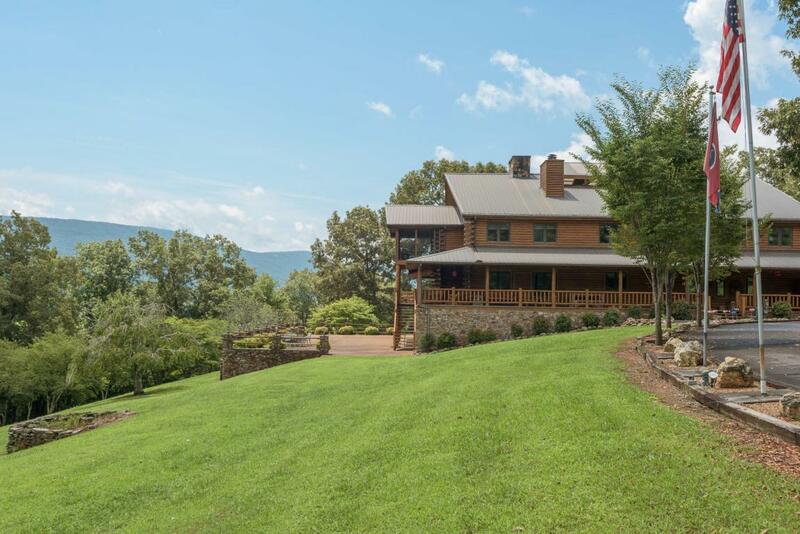 At the top of the driveway, the home is situated above the tree line and open to a most breathtaking view of the Sequathchie Valley and surrounding mountains. On a clear day, watch from the East porch as the Hang gliders take off from the mountain top and glide their way to the pastoral valley below. The house is no less impressive.The round log timber construction and stone foundation blend in with its natural setting. The wrap around rocking chair porch provides gorgeous views all around. Outdoor entertaining is a breeze on the 3000 sf stone and concrete patio and an ideal setting for wedding receptions, family gatherings, office parties, etc. The interior is no less impressive with exposed timber logs, hewn hardwood floors from salvaged structural beams, tongue and groove raised ceilings, walls of windows, 7 fireplaces and a most UNIQUE FEATURE...a 3-story Atrium with clerestory windows and skylights in the center of the home. Talk about bringing the outside living inside!! The home is built in a basic square design with rooms all around. Upper level balconies access the Atrium from the 2nd level and Glass French doors open from several rooms on the main level. The main level is sure to impress. The Entry Hall with it's 3-story stone fireplace and wrap around wood staircase and balcony, exposed logs and beams is filled with light from multiple windows above. The main level rooms are spacious, yet cozy and feature a wood burning or gas log fireplace. Most have access to the Atrium and wrap around porch. Upstairs are 2 junior Master Suites with fireplaces, an additional 2 guest bedrooms, 2 gathering rooms, home office/library and 2 screened porches. Every room has an incredible view! The unfinished basement, that used to be a cabinet shop during construction of the house is accessed from both sides of the garage, is heated and cooled, has several workbenches and work stations complete with a central vacuum system. Double doors lead onto the ground level patio. Outside are extensive manicured grounds that extend down to the river. A Quonset hut with a 3-sided wrap around, covered deck provides ample storage for equipment, motor home, boats, outdoor toys, etc. You name it...there's room for it. CHECK THIS OUT: the hut has water, gas, electric AND a full bath! No need to run back to the house. I could keep going on about this place...but...it's better to experience it in person! !